It is incredibly easy to slide towards illegal teaching work in China. I met Sally, a Chinese English language teacher, on the streets of Qinghe, Haidian district, in Beijing in the spring of 2017. I was looking for a nail salon that I had an appointment with. But instead of helping me with directions, Sally offered me a job right on the spot. "We are looking for foreign English language teachers at our school," she said. "When can you start?" I was busy at the time, but I still added her on WeChat. Over a year later, Sally still sends me job offers. She also asks me to recommend my foreign friends to her, but "he better come from a developed Western country." "It is the stereotype for Chinese parents, so do not think too much," she explained after I expressed my concern about the requirements. The pay was 1,500 yuan ($235) for five-hour blocks on the weekend. It was more than I was making with my full-time job, so I was tempted to accept. But my colleague at work warned me against it. "Did you hear about the two Irish teachers who got arrested because of their side jobs teaching English?" she asked me. I hadn't. But after doing some research, I found that the two Irish women's situation was very similar to mine. They were working full-time jobs as teachers for the company that had applied for their work visas. At the same time, they had accepted side jobs at a school that was not licensed to employ foreigners. During a police raid at the school, the officers arrested 11 people, including the two Irish women, the Irish Times reported. They were released after spending more than a week in detention. The women were kept in separate cells and were not allowed to call their families while in custody. But they were not deported, people close to the matter told the Irish Times. I talked to a few teachers to get a feel for the impact the incident has had on the Beijing teaching community. Tracy Feerick is as a high school English language teacher at the 21st Century Beijing International School. The incident shocked and scared her, but did not surprise her because "it seems like there are a lot of illegal teachers in China." However, she does not think that the prominent case of the two Irish women will change that. "People who have side jobs are just going to keep them. They just probably won't talk about them that much," she said. Feerick said she had been told "many times" that she isn't allowed to take part-time teaching jobs on her visa. But in 2017, she found herself in a situation where she had to work on a tourist visa for eight months because her school was in the process of giving her a work visa. Meryl (pseudonym), withheld her real name because the private international institution she works for prohibits her from speaking to the media. She thinks it is "sad" that nobody told the Irish women that they were not allowed to have a second job. For her, the women's detention is a "big warning." "It's also on the contract," she said. "It's not worth it to get a side gig for just that little bit of extra cash." 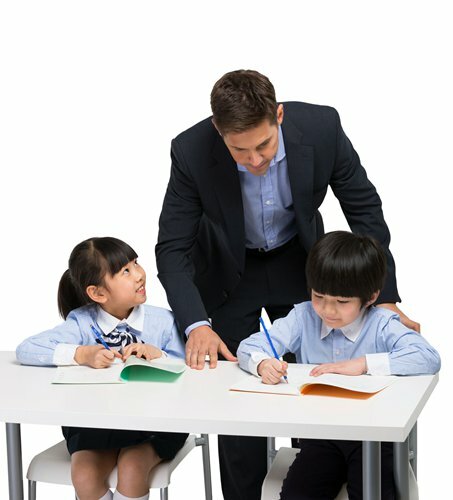 Chinese parents who pay more money for their children to be educated by native English speakers are often unaware of their kid's teacher's precarious legal situation. What drives the teachers into illegality is not only schools that can't offer proper work visas for them but also that their own qualifications do not meet China's work visa requirements. To teach in China legally, the applicant has to be native in the language they teach, have a bachelor's degree and at least two years of teaching experience. Yegor (pseudonym), belongs to this category. He's a passionate and popular English teacher. Yegor tells everyone that he's half English, half Polish and has a cute little backstory about the small town in England where his mom grew up that he hasn't visited in ages. But Yegor has never been to England, and he is 100 percent Polish, which means he cannot apply for a proper work visa as an English teacher. "The worst part is, if I tell the parents the truth, they won't trust my English skills anymore," he explained. He works high-paid, part-time jobs to finance his life as an aspiring rock star with his band. Every three months, he takes a bus from Beijing to Mongolia. It's the quickest and cheapest way to renew his business visa, as it only takes 24 hours and around 1,000 yuan ($157). Teaching on a student, business or tourist visa or as a side job is so common that no one in the expat community bats an eyelash. Owen Johnston from the UK has had various teaching jobs during the four years he lived in China. "In my previous company they definitely had a few police raids where the staff was kept overnight," he said. "It's kind of an occupational hazard. When teaching in China, expect everything to be riskier." Being well aware of that risk, Johnston said he always made sure to be on a proper visa when starting a new job. There has only been a short period where he worked on a business visa before his school got through with the paperwork, he said. To find out if the schools really did not care about employing teachers who lacked the proper paperwork, I decided to investigate Sally's workplace to find out how far they would go to employ me, knowing that they are not licensed and I am not allowed to work for them on my visa. Apparently, Sally was under the impression that I was in China on a spousal visa because she knows of my Chinese boyfriend. It's illegal to work on a spousal visa, but for Sally's school, the only thing that mattered was that I would be able to stay in China long-term. When I clarified that I already had a work visa, Sally was happy too. I informed her that I would violate the laws of my work permit by getting a side job and also asked her if their school was licensed to employ foreigners. Sally had already prepared an answer. "The company said that from now on, the salary will be paid in cash, so the police can't find any information about you," she texted me. In the event of an unexpected police raid, she suggested I tell the police that I was just there to play with the kids. "We have security guards in the building. The average person can't get in; nobody will be able to betray you to the police," she said. To assist foreigners who find themselves in complicated visa situations or have issues with their companies, Kyle H, who withheld his full name out of concern for his family, created the organization ExpatRights in 2017. One of ExpatRights' services is to offer free legal advice. According to Kyle's experience as a long-term expat based in Hangzhou, the capital of East China's Zhejiang Province, "the majority of people are teaching illegally in China." He compares their situation to the undocumented Mexican farmworkers in the southern states of the US. The favorable market conditions encourage foreign workers to come to China, Kyle said. While the entry barriers to open an English school are low, getting the license to employ foreigners must be challenging, Kyle explained. According to Chapter 2, Article 5 of the Rules for the Administration of Employment of Foreigners in China, "The employer shall apply for the employment permission if it intends to employ foreigners." According to INS, a consulting firm in China that helps foreign companies expand into China, requirements for both applicants and employees change multiple times a year, with the visa system already being very complex. "Everyone involved makes a huge amount of money, so everyone wants it, the parents, the schools, and the teachers," Kyle said. With legal requirements being high, these are the ideal conditions for a black market to emerge. If schools hire illegally, they decrease costs by as much as 40 percent by avoiding taxes and benefits payments, Dan Harris, a Chinese law expert, told the online magazine Vice. To prove that English language schools were all too willing to employ foreign teachers illegally, Kyle ran an experiment with the Beijinger's classifieds section by applying for every teaching job on the first two pages. In his email, he clearly stated that he did not have a degree and was therefore not qualified for a work visa. "Eighty-eight percent of the schools were keen on getting me onboard anyway," he said, summarizing the results. Only one out of 20 employers declined his application. According to China's new immigration law of 2013, employers can be fined up to 100,000 yuan for each illegally employed foreigner, the South China Morning Post reported. Foreigners who work illegally can be fined between 5,000 yuan to 20,000 yuan, detained between five and 15 days and face deportation. "A lot of the burden and blame falls solely on the teachers," Kyle said. The US Embassy, being well aware of the situation, has come up with an extensive guide to teaching in China. "It is up to each individual to evaluate potential employers before signing a contract," they write on their website. In this blame game where schools refuse to take responsibility, teachers are left with looking out for themselves. After all, illegal work is the main reason expats are deported from China, the Irish Times reported. So, I decided to resist the temptation of earning a little extra money in exchange for risking my work visa and deleted Sally from my WeChat contacts.